With Thanksgiving just a few days away it’s almost time to start thinking about holiday shopping! I love checking out all the gift guides that pop up this time of year, and this season I decided to share my own! Everything on the list below I actually own, use and LOVE – otherwise I wouldn’t recommend it! Can’t get enough running information?? Be sure to add a subscription to Runner’s World or some running books to your holiday wishlist! 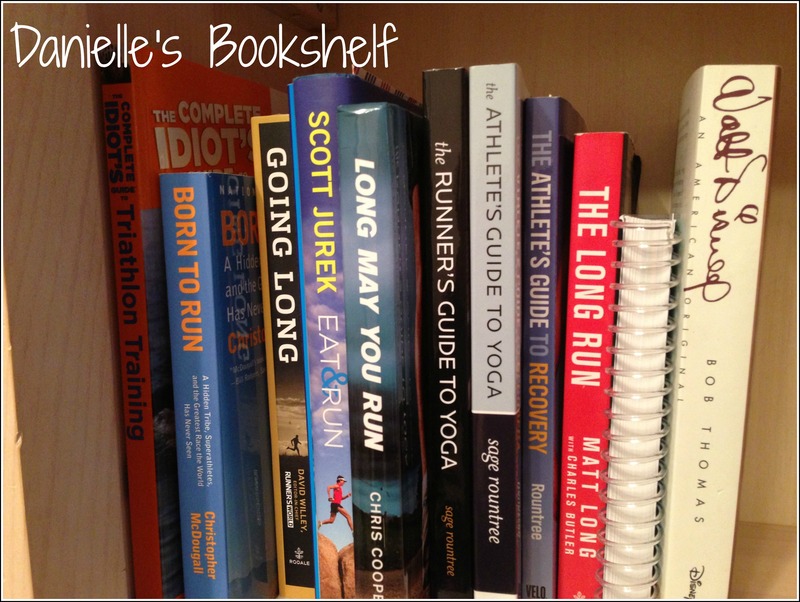 Amanda at Run to the Finish recently put together a great list of her top 50 running books if you’re looking for some ideas and the photo below has a few of my favorites (I can’t recommend The Long Run enough!). This is a must have item for all runners and I’m SO embarrassed to say I only recently got one! Not only is Road ID a form of identification should something happen to you while out on a run (bike ride, etc. ), but it also has contacts listed in case of an emergency. 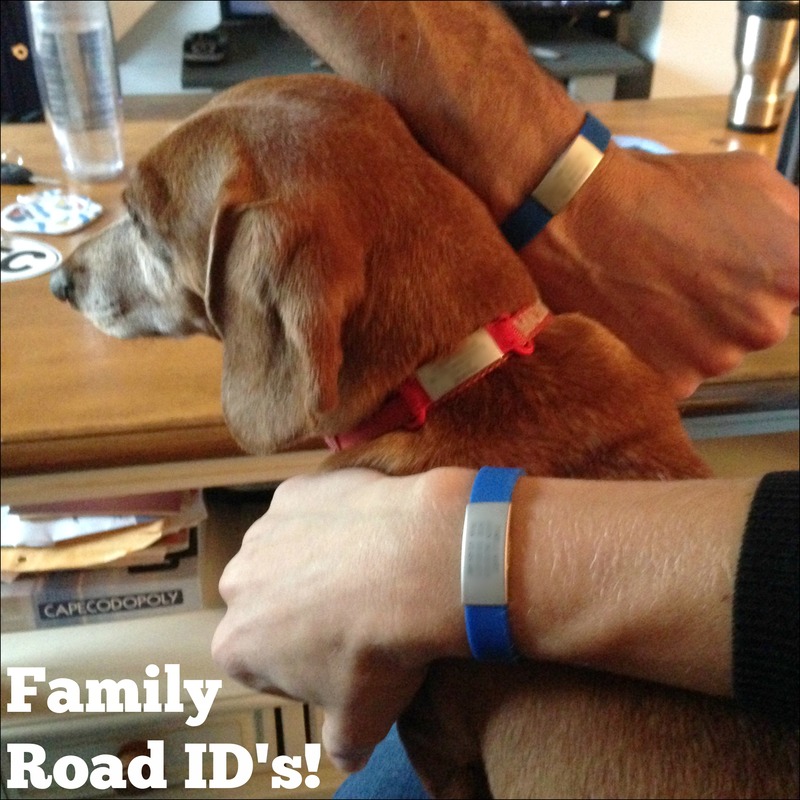 There are Road ID’s available for your wrist, ankle or to put on your shoe – they even make ID’s for your pet that attach right on to any collar! The engraved contact info is incredibly clear – I’ve just blurred ours out! Road ID also recently launched a mobile application that uses eCrumb tracking and an emergency alert system to supplement the physical Road ID so your friends and family can literally keep track of you while you’re out on the roads! Road ID has generously offered a $35 gift card giveaway! Having a great water bottle makes staying hydrated that much easier! Jason and I personally love our Tervis products and there’s guaranteed to be a perfect one for every person since they not only come in all different shapes and sizes, but have designs ranging from sports teams to Disney, to holidays and animals! Under normal circumstances, socks probably fall into the category of “not-so-great holiday gifts”, but running socks are a different story! 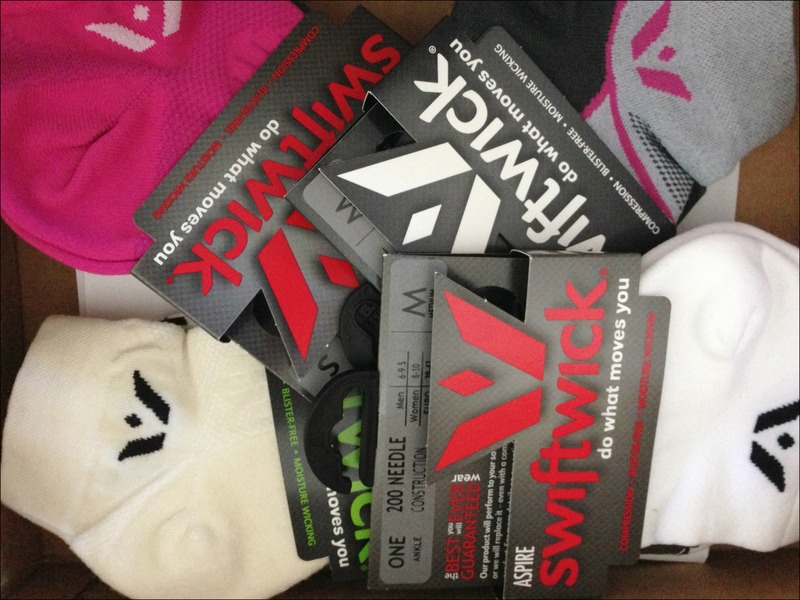 For 10% off your Swiftwick order use code “LiveRunGrow10”! Ever struggle with your shoe laces staying tied on a run?? I tried Lock Laces for the first time during a triathlon this summer since I figured it would be easier to be able to just slip my sneakers on during transition and they were great! I’m not sure why, but I never ended up ordering more to switch over the laces in my other sneakers, but after my shoes came untied TWICE during a recent half marathon (and most likely cost me a PR since I missed it by only 27 seconds! ), I’m planning on taking advantage of the great offer Lock Laces has going on right now (3 pairs for $23.99!) and getting myself a few pairs (not to mention maybe a few for stocking stuffers!). Lock Laces has given me several pairs to giveaway to you! Dealing with some aches and pains?? I was definitely skeptical about the benefits of kinesiology tape (I mean really, what could it possibly do?!? ), but I finally gave in and tried some on my foot for my plantar fasciitis and now I use it for every long run! 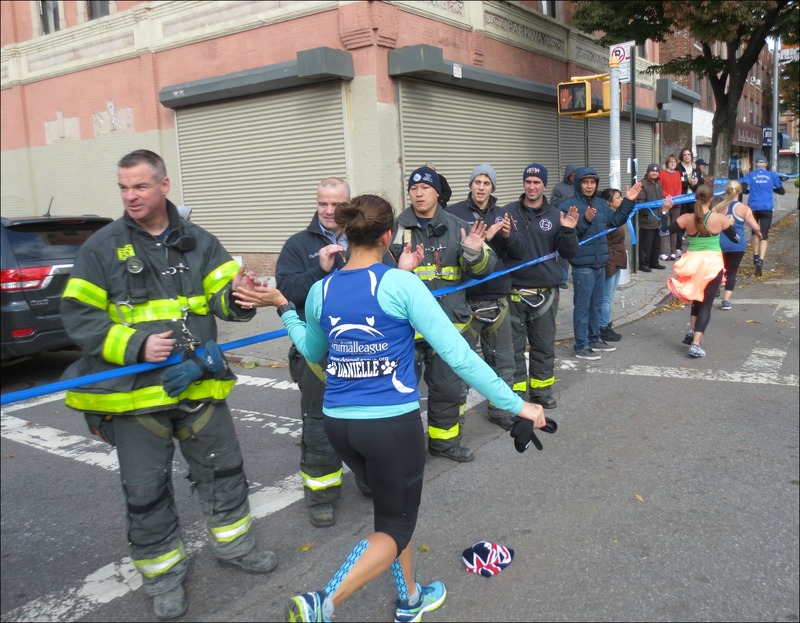 I also love all the awesome colors and designs ROCKTAPE comes in – check out this great argyle I used for the New York City Marathon! Raise your hand if all your hard earned medals live in a shoe box in your closet! 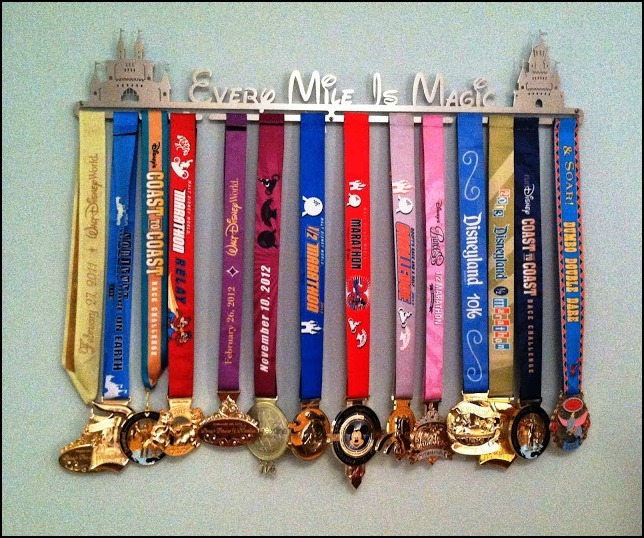 Why not show off your accomplishments by hanging them on a medal rack! There are plenty of options available out there, but one of the reasons I love Allied Medal Displays is because not only do they offer a wide variety of designs, themes and sizes, but you can also create a custom medal rack! Photo courtesy of We Run Disney! For 10% off your Allied Medal Display order use code “LiveRunGrow”! Now that we’ve taken care of your medals, what about all those race t-shirts?? I’ve been saving all mine to one day make a quilt out of them (not that I am anywhere near talented enough to make a quilt!). My friend Carlee and the Project Repat blanket she recently had made! 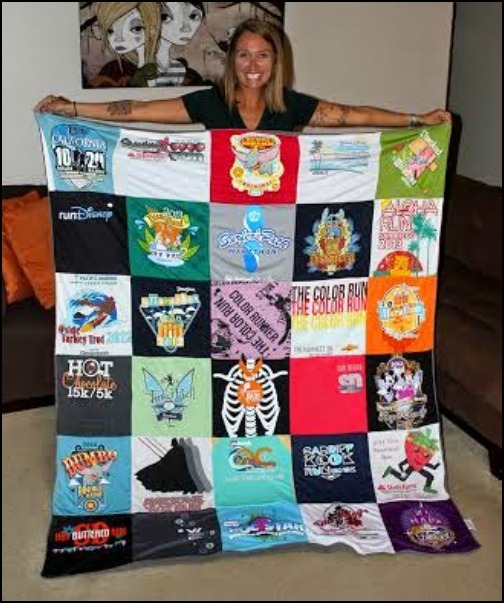 Project Repat even offers gift certificates so you can give a friend or family member the gift of up-cycling their race (or concert/ college/ sporting) t-shirts into a custom blanket! For a more detailed look at Project Repat, and to enter for a chance to win $100 off a Project Repat t-shirt blanket, visit my 3 Year Blogiversary & Giveaway post from last week! For 20% off your Project Repat order use code “repatlrg”! 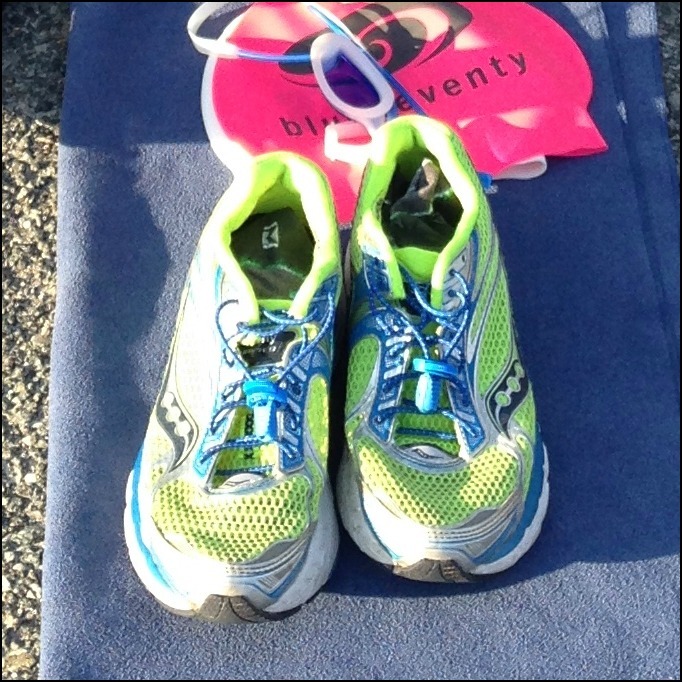 Registration costs can certainly add up – I sure know I’d love the gift of a race! While it may not be the most creative gift, when in doubt you can never go wrong with a gift certificate! For runner’s think local running store (Marathon Sports for me! ), Amazon (cause what can’t you get on Amazon!) or a massage! Mandatory: Leave a comment letting me know one safety precaution you take when you go out to run. What’s on your wish list this year?? It’s all about the STUFF! And I’m loving the Rock Tape better than the KT tape. It just sticks better. 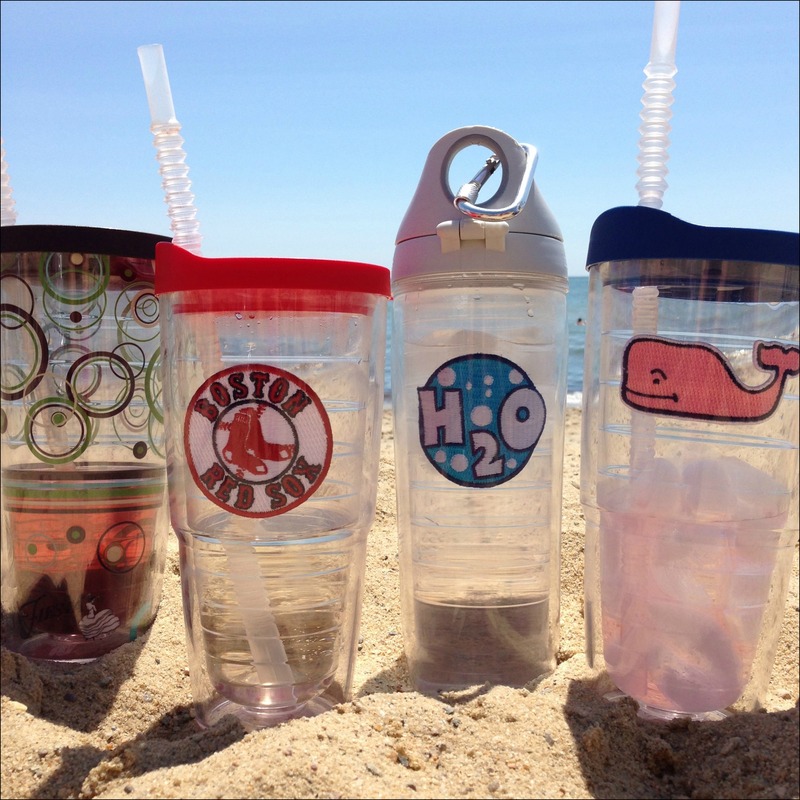 And kudos on your obvious glorious taste in baseball cups. Oh my goodness, it’s AMAZING how much better the ROCK TAPE sticks than KT, I’m so glad I ended up trying a different brand! I love Rocktape so much better than KT tape. I do have one of these items purchased for another runner in the family and I hope they love it. I would love lock laces because i always lace up the extra holes at the top of my shoe (for more support) and some laces that are given to you with the shoes aren’t long enough! I really do like the Lock Laces, it’s so easy to get your shoes on and off and you don’t have to worry about them coming untied! I just recently got some reflective gear since I started running at night with my run club, always good when you’re running without full light! I have been saying for years I need one of those blankets!!! I can’t wait to get mine, I love the memories behind all those shirts, but I never wear them, now I’ll get to see them all the time! I love lock laces! I have them on my running shoes and I’ve NEVER had an issue. I also have a Road ID and love it–just got a new one with my new married name 🙂 I also follow Road ID on Twitter (@raeisadarlin). Thanks for the giveaways! I’ve been looking into getting a Road ID for a while now, just haven’t bit the bullet and ordered yet. For now I try not to go alone but if I do, I make sure to tell someone my exact route and when I expect to be back. And I always bring my phone just case. I’ll have to look into the app but my phone is so old, it probably won’t work on it. My son has a pair of the Lock Laces just to make changing for PE a little quicker. I’ve never had any real wardrobe malfunctions on a run yet but having to stop mid-race to retie a shoelace would be very annoying! Thanks for the great list of ideas. I’m definitely going to Amazon to look for The Long Run for my Kindle! I was totally the same way! For the longest time I just kept saying, “I really need to get one…” and I’d look at the website and then never order it! I hope it never needs to be used, but I’m glad I finally got one! And on my goodness, yes, definitely get The Long Run, I love it! This is a super duper list! I’ve never read The Long Run so I may add that to my list. I noticed Born to Run on your bookshelf and as hard as I tried, I just could not get into that book so I put it aside. Maybe some other time. Right now I’m reading The Boys in the Boat which is about the men’s rowing team at the 1936 (?) Olympics. Pretty interesting. Meb’s book is great too! Love the socks comment, ha! Definitely breaking the cliche about them being a boring holiday gift! I gave the gift of Road IDs to young children in our family last year, the best! To be honest, I could do a better job with safety. Really all I do when running at night is stick to main roads and well lit parks.